It turns out that a lot of people saw the iPad’s appeal: it’s a supremely portable device that’s well suited for checking your e-mail, surfing the Web, playing games, reading books and other stuff you get off the Internet, and even for getting work done. Kids and the elderly have embraced it. It’s awfully hard to follow such a massive success, but that’s the task set out for Apple’s new iPad 2, which goes on sale Friday. At least the iPad 2 has this going for it: the original model caught the technology industry so flat-footed that only now are true competitors beginning to appear. Those competitors will now face a new iteration of the iPad, one that’s faster, smaller, and lighter than the model introduced a year ago—all while retaining the $499 entry price that has proven all but impossible for Apple’s competitors to match. It’s almost unfair. Call it Jobs’s Law if you like: The latest version of any Apple product is likely to be thinner and lighter than its predecessor. And so it is with the iPad 2. The size difference between the original iPad and the iPad 2 may seem slight, but that’s only because we’re dealing with such small products to begin with. But for products this small, every ounce and fraction of an inch counts. The iPad 2 measures 7.31 by 9.5 by 0.34 inches, and weighs in at 1.33 pounds (in the case of the Wi-Fi-only version, that is—the AT&T and Verizon 3G versions are .01 and .02 pound heavier). That means Apple shaved .17 pound off the Wi-Fi version and .26 to .27 pound off the 3G version. The iPad 2 is also .16 inch narrower, .06 inch shorter, and .16 inch thinner than the original iPad. A matter of small degrees, to be sure, until you consider the percentage change: the iPad 2 is roughly two-thirds the thickness of the original iPad, and 88 percent of its weight (83 percent when comparing 3G models). Pick up an iPad 2 after handling an original iPad, and you’ll notice the difference right away. This is a lighter, thinner device. The iPad 2's back is a single curved surface. The sleep/wake button (left) is perched on the curve. Also pictured here: the rear-facing camera and the orientation/mute switch. Without those edges, the iPad 2’s ports and buttons are now positioned on a curving portion of the back panel, rather than on its side. The feel is quite different, a bit like reverting the flat surfaces of the iPhone 4 to the curved back of an iPhone 3G. A few times I found myself struggling to insert cables into the iPad 2’s dock connector at the proper angle because I was confused by the curve of the back panel. The end result of all this slimming down is that the iPad 2 is easier to handle than the original model. In my review of the original iPad, I said it was “heavy enough and slippery enough that I found it difficult to hold in one hand.” In fact, the original iPad turned out to be a product that really demanded a case of some sort, just to make it easier to handle. The original iPad came in six different variations—Wi-Fi-only and Wi-Fi/3G versions, each available with 16GB, 32GB, or 64GB of storage. The product was such a hit that Apple apparently decided that even more variations would be better—as a result, there are 18 different versions of the iPad 2. It’s a little crazy. The good news is that the iPad 2 costs just what the original iPad did. The base-model Wi-Fi editions cost $499 (16GB), $599 (32GB), and $699 (64GB). Both sets of Wi-Fi/3G models cost $130 more than their Wi-Fi counterparts. There’s no price difference for white or black models. Though it’s thinner and lighter, the iPad 2, at a glance, looks very much like the original iPad. Its front is a sheet of glass over a bright 1024-by-768-pixel display surrounded by a bezel (again, now available in black or white) that’s going to be necessary so long as humans grasp with opposable thumbs. The aluminum frame around the outside of the bezel of the original iPad has been reduced to a thin edge, almost entirely invisible, in the iPad 2. The position of the iPad 2’s buttons and ports are, likewise, more or less undisturbed. There’s a sleep/wake button at the top right edge, a standard headphone jack at top left, a volume rocker and a sliding switch (configurable to lock screen orientation or mute alert sounds via the Settings app) at the top of the right side, a 30-pin dock connector port at the bottom, and a home button at the bottom of the front face. The iPad 2’s built-in microphone is dead center at the top edge of the device—it was next to the headphone jack on the original iPad. Both 3G models feature a black plastic cutout along the top rear face in order to improve cellular reception; the AT&T 3G model also has a micro-SIM card slot along the top left edge. 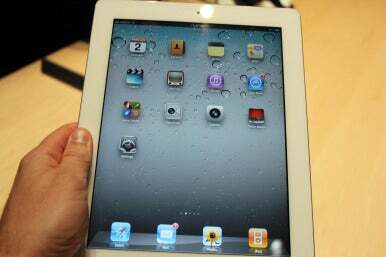 The iPad 2 uses a new Apple-designed processor called the A5, which is making its first appearance on the scene. Apple is generally cagey about tech specs for products like the iPhone and iPad, but by all accounts, the A5 is a dual-core version of the 1GHz A4 chip that powers the iPhone 4 and the original iPad. The iPad 2 also has 512MB of RAM—twice that of the original iPad—and a 200MHz bus speed, likewise twice that of the original. Because the A5 is a dual-core processor, Apple claims the iPad 2 can run at speeds up to double that of the original iPad. As with any dual-core processor, the key about “up to double” is that software must be optimized to take advantage of multiple processor cores, or that speed goes to waste. This is the first dual-core processor to appear on an iOS device, and it’ll be interesting to see under what circumstances the A5 is noticeably faster than the A4, and when it’s not. But processor speed isn’t the only part of the system that determines how it performs. Graphics performance has become a major component in determining how fast a computing device feels. And Apple says that the graphics performance on the iPad 2 is as much as nine times faster than on the original iPad. So does the iPad 2 measure up to Apple’s claims? Absolutely, though it’s hard to determine whether the dual-core processor or the improved graphics performance deserve the credit. (Maybe the question is moot.) From the moment I started using the iPad 2 with familiar apps from my original iPad, I could tell that the system was faster. I thought scrolling through tweets in Twitterrific on my iPad was smooth as can be … until I scrolled through the tweet list on the iPad 2. Everything felt smoother, and items loaded faster. In short, the iPad 2 is the fastest iOS device ever made, by a long shot. And it’s not just an academic distinction: you can sense the speed when you use it, because everything’s faster and smoother than it was on the original iPad. Despite the boosts in processing power, Apple claims that the iPad 2 has the same ten-hour battery life as the original model. In nearly a week of use, I never saw a reason to disbelieve the claims. The iPad’s all-day battery life, perhaps its killer feature, remains intact. The original iPad debuted just before Apple embraced video chat with its FaceTime software and added a front-facing camera to the iPhone. (It subsequently added both front- and rear-facing cameras to the iPod touch.) With the iPad 2, the company has brought two cameras to all of its mobile iOS devices. The cameras in the iPad 2 are essentially the same as those in the fourth-generation iPod touch: it’s nice that they’re there, but they’re not particularly impressive in terms of quality. The front-facing camera is the same one used in the iPhone 4 and the iPod touch, offering only VGA resolution (640 by 480 pixels). It’s grainy in low-light settings, but is perfectly serviceable for its intended purpose, which is video chat. Once you’ve connected, the iPad’s larger screen definitely exposes the low quality of FaceTime video (whether it’s caused by the low-quality camera or the intense bandwidth required by a live video chat, or both, is debatable). Still, the video is good enough to be usable. The iPad’s size, however, makes it a bit ungainly as a FaceTime device. It’s hard to have a long conversation while holding the iPad in your hand. Propping the tablet on a tabletop or in your lap works better; propping it up with Apple’s Smart Cover in typing position gave my interlocutor a nice view of my ceiling fan, while putting it in the Smart Cover’s movie-viewing position made me hunch down in order to get in the frame. The rear camera on the iPad 2 appears to be identical to the one found on the iPod touch. (It’s positioned just beneath the sleep button on the back side of the device, creating a challenge for iPad casemakers everywhere.) Apple touts this camera as being “for video,” and there’s a reason: as a still camera it’s about seven-tenths of a megapixel, with poor performance in low-light conditions. But it’s capable of shooting 720p HD video and, in well-lit environments, the quality is decent. I’m not sure I’m ever going to hold up the iPad 2 and use it as a video camera, but it does work—and most important, you can use that camera from within FaceTime, so you can shoot video of your kids crazily running around and send it all back to grandma. Apple’s relationship with Verizon Wireless in the United States continues to deepen. The first sign of an alliance was when Verizon began selling iPads in its stores, bundled with a MiFi wireless router. Then came the Verizon iPhone 4.